Old lady learning karate. This is my life. I’m not the sharpest kama on the mat at 8 am, so I’m quite gleeful that I made it through classes this morning in one piece. I did not block with my face, did not spear my brain with my sai, and did not hurt myself in any manner. Believe it or not, a week in Chicago eating all my favorite foods did not prepare me well for last night’s class! 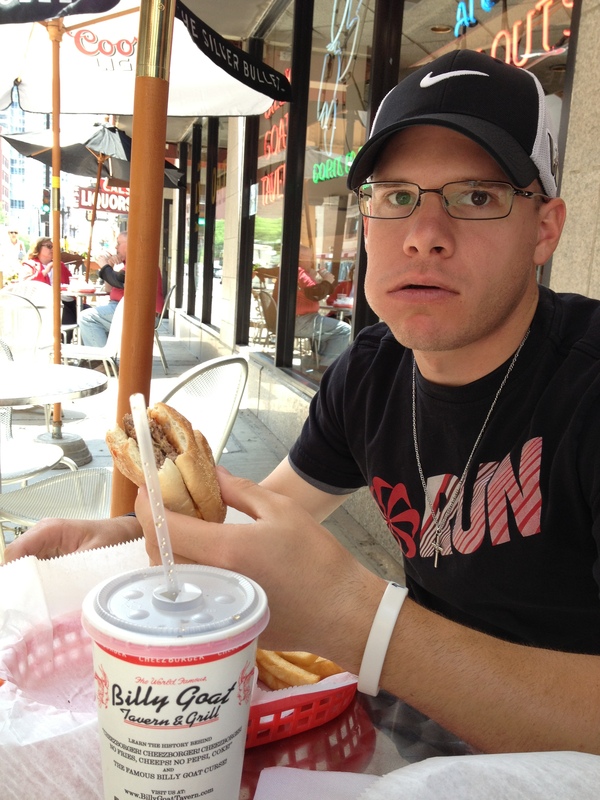 The Pretty One enjoying his Cheezborger! Cheezborger! Cheezborger! Seven days of Chicago hot dogs, Italian beef, cheese fries, coffee cake, pasta, Blackhawks watch party snack food, and more… Oh, I was a happy girl!!! But that’s not exactly smart training food. Especially when you don’t get much exercise. The Pretty One and I walked around downtown Chicago for about 5 hours one afternoon. And my family spends lots of time shopping, which fortunately requires lots of walking. That should count for something! =D But no kicks, no punches, no kata, no weapons, no “workout” so to speak. I didn’t expect to be at my best last night, and I wasn’t. But I think I did a bit better than I expected. Class was a session of alternating kata and self-defense sets. I really enjoyed going back and forth between the two, but at some point, I ran out of energy. Pfffttttt. It was all gone. When we got to weapons, I had a tough time swinging my tonfa, and the jump spin in my tonfa kata? Bwahahaha!!!! 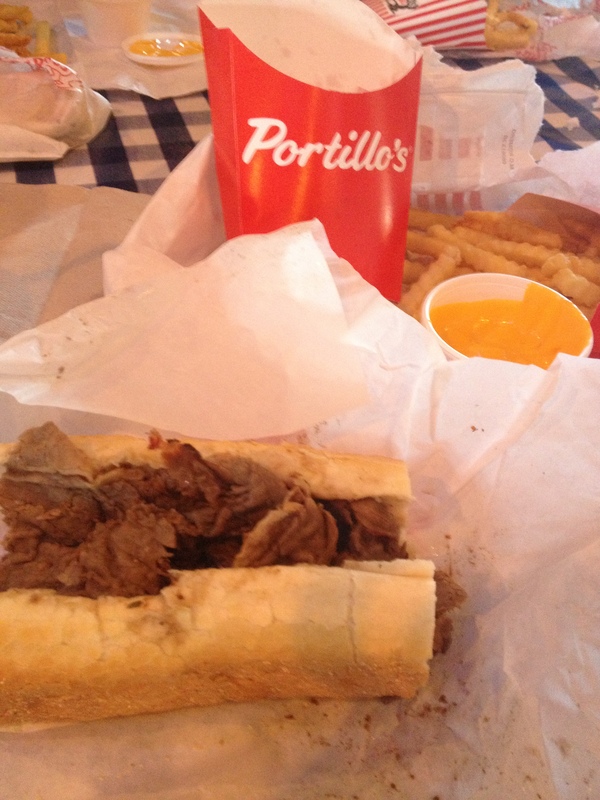 I really don’t want to blame it on my Chicago Diet — after all, I grew up on that stuff. And once upon a time (OK, 30+ years ago!) I was a decent hurdler and volleyball player…fueled by all that yummy stuff! So let’s just say I should have slipped in some karate while I was watching the Blackhawks win the Stanley Cup. Yeah, let’s just say that! And now that I’m back in Kansas City, hundreds of miles away from the temptation of my favorite foods, it’s time to detox. Bring on the green tea, fresh fruits & veggies, and that other healthy stuff. Definitely not as tasty as Chicago dogs and Italian beef, at least not to this Chicago girl, but it’ll help me perform better. At least that’s the plan! I just got my notification for my next Weapons test. I’ll be testing for purple belt in a few weeks. I’m SO excited!!! I’m heading to Chicago tomorrow for a week’s vacation but when I return, I’ll be working hard with my bo, tonfa and sai so I can make a good showing at my test. Welcome to NetsmartLife! Explore and learn about careers, culture and life at Netsmart!